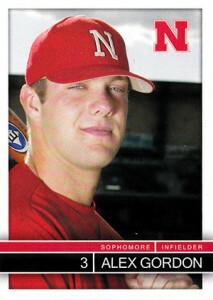 As the second pick in the 2005 draft, Alex Gordon cards came with a lot of early hype. Further fueling that fact was a card that wasn't supposed to be that has reached a place of modern hobby infamy. Although Gordon has had his moments and is definitely a potential threat at the plate, the early part of his career failed to live up to the immense expectations put upon him in the hobby. 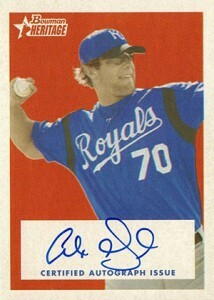 Shop for Alex Gordon cards on eBay. 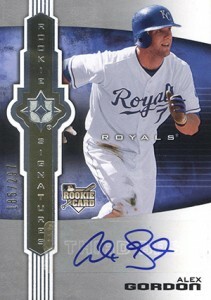 Alex Gordon has no shortage of rookie cards, which are found in 2007 products. They range in value from very little to decent amounts for limited autographs. 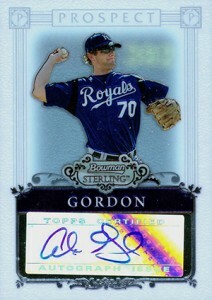 However, these are not the first Alex Gordon cards to hit the market. His cardboard debut came in 1993 with a college card issued by the Nebraska Cornhuskers. It's not easy to find, although it's also not very well known either. 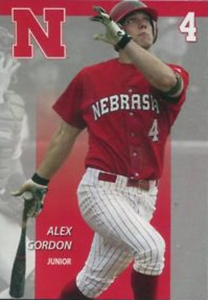 Nebraska issued more Alex Gordon cards in later years as well. 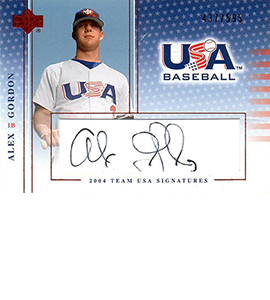 Thanks to their deal with USA Baseball, Upper Deck issued Alex Gordon cards in 2004. 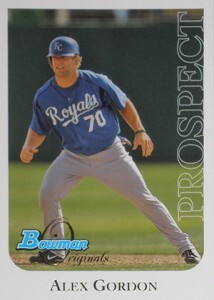 While most were a part of a premium box set (including his first autographs), 2004 SP Top Prospects has a memorabilia card. 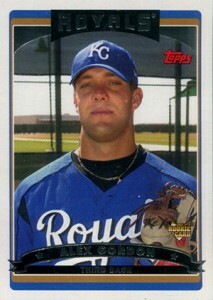 The first MLB Alex Gordon cards came in 2006. Most of these are Prospect-themed inserts in various Bowman products including autographs in Bowman Chrome, Bowman Heritage and Bowman Sterling. 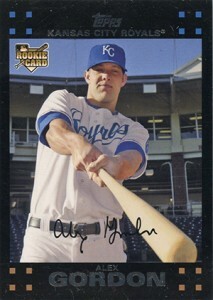 The best-known Alex Gordon card was inserted in 2006 Topps Baseball. This was the first year that the MLBPA decreed that players only appear in base sets after their big league debuts. 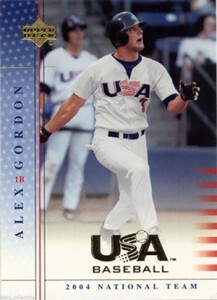 For whatever reason, Topps designed 2006 Topps Series 1 to include Gordon. 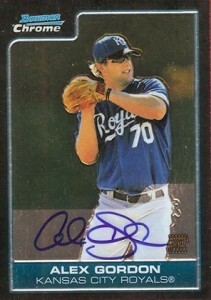 However, when he failed to crack the Royals roster, they had to pull the card. That didn't stop some from making their way into packs and onto the secondary market. 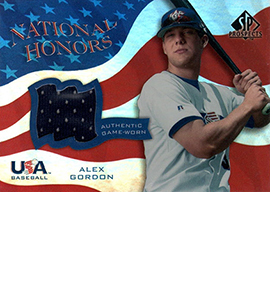 At one point, the 2006 Topps Alex Gordon cards were selling for several thousand dollars. They have since dropped significantly but still sell very strongly. 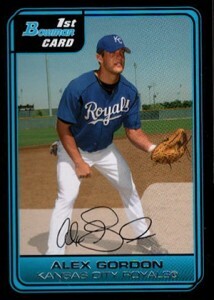 The 2006 Topps Alex Gordon has a few different versions. The full version is the most popular. There's also a cut out version that has Gordon's image removed. The final two variants simply have silver or gold foil and no other images or text on the front. A similar situation happened with 2006 Topps Heritage. 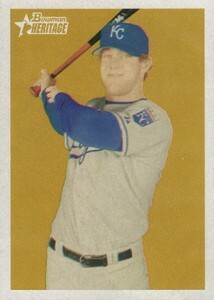 The set has a limited number of cut-out Alex Gordon cards. It's not nearly as popular or infamous as the base Topps card, though. With Alex Gordon and the Kansas City Royals enjoying postseason success, his cards should be considered volatile right now. That said, they're not coming close to the extreme prices a lot of his first cards were at when they first came out. Several decent early prospect and rookie cards can be found for solid prices, especially when you compare them to a lot of unproven prospects. 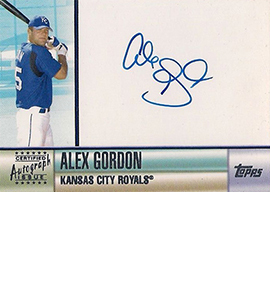 Should the Royals take the World Series, expect interest in Alex Gordon cards to experience a surge, albeit a brief one. It's going to take multiple titles and consistently strong numbers to vault him back into the hobby elite. 2019 TOPPS GYPSY QUEEN ALEX GORDON BLACK BORDER # 1 1 TRUE ONE OF ONE !!!!!!!!!! 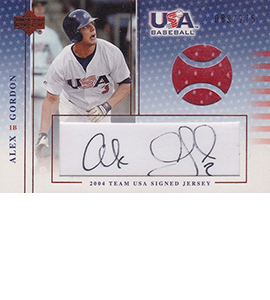 2007 Upper Deck Alex Gordon RC - 1-of-a-kind hand signed Royals's fan fave! Click on the links to shop for specific cards and check values on eBay.